WEBINAR: Got CRM? Why You Need Marketing Automation, Too! If you follow the Ledgeview Partners blog, odds are you have some sort of CRM system or are considering implementing one within your organization. Whatever business size, department or industry you are a part of, this webinar will be highly beneficial for all those using CRM or for those who are interested in utilizing its vast capabilities. CRM and marketing automation systems are complementary systems that work stronger together. There is a common misconception that if you have one, you don’t need the other, but this is the furthest from the truth! CRM systems help to transform sales through your organization, while marketing automation systems help you complete the picture by generating and nurturing leads while helping you move them from marketing-qualified to sales-qualified. In this webinar, you’ll learn more about why you actually need both. As always, you don’t need to be a Ledgeview customer to attend (so there’s really no reason to not join the webinar). 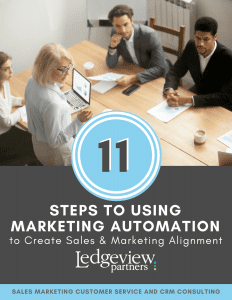 If you want to learn more about the power of marketing automation before you join us this September, read our new eBook: “11 Steps to Using Marketing Automation to Create Sales and Marketing Alignment”.